I think it's a damn shame that ginger snaps/bread/basically any baked good featuring ginger are too often relegated to "seasonal" status. Ginger is delicious all year round and its ability to add some tongue-tingling spice to sweets without scorching sensitive palates and giving rise to torrential runny noses is truly unique. I challenge you to try the same thing with chili powder. 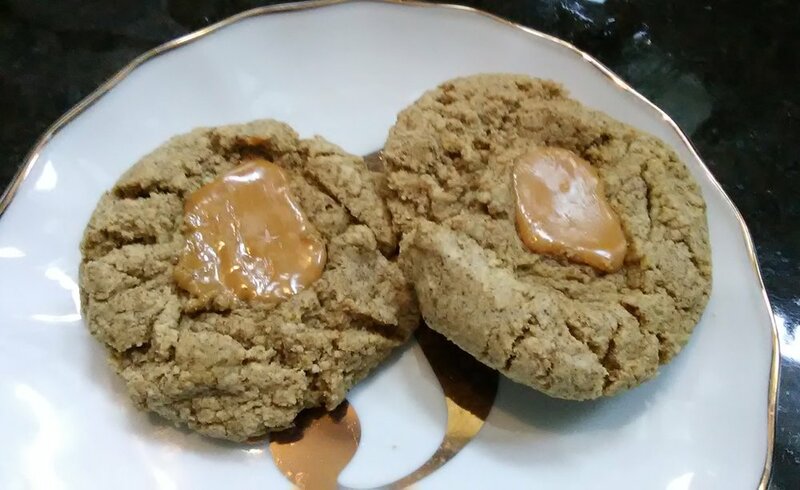 I added caramels for some buttery contrast to this basic recipe for chewy gingersnaps, which, by the way, one could argue is an oxymoron if you subscribe to the idea that the 'snap' part of the name is designed to reflect the easily breakable, crisp texture of the cookie. I don't. When making these cookies, it's important to remember that the caramels should only be slightly melted when you remove your tray from the oven. Five minutes rest time on the tray renders them the perfect consistency from the latent heat. 1. Preheat oven to 350 degrees Fahrenheit. Line 2 baking trays with parchment paper. 2. Cream butter and sugar in a large mixing bowl. Then beat in egg. 3. In a separate bowl, thoroughly combine flour, ginger, baking soda, cinnamon, cloves, and salt. 4. Gradually add dry ingredient mixture to wet ingredient mixture. 5. Shape dough into balls roughly 1 and 1/2 inches in size. Press one full caramel into the center of each ball. 6. Bake 11-13 minutes. Remove trays from oven. Let cookies rest on trays for 5 minutes or until caramels are just about to ooze all over the cookies. 7. Eat immediately and with caution if you have loose dental work.